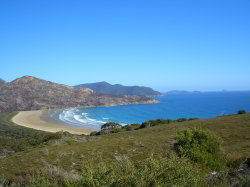 he most southern point of the Australian mainland, Wilsons Promontory (affectionately known to Victorians as the Prom) is arguably the most loved national park in Victoria. Its 130 km coastline is framed by granite headlands, mountains, forests and fern gullies. Tidal River, 30 km inside the park boundary, is the focus for tourism and recreation. The park contains the largest coastal wilderness area in Victoria. The drive from Yanakie to Tidal River is very scenic and full of interest. Drive slowly and carefully to avoid collisions with wildlife and enjoy the views. 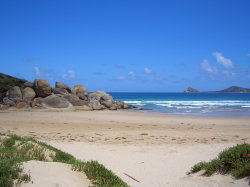 Enjoy the beautiful sandy beach along Tidal River at Norman Bay. This beach is safe for swimming and a delight for children and adults to explore. Walk to Squeaky Beach with its pure white quartz sand. The beach was once known as the "singing sands" because of the sound made when walking on it. Walk up Mt Oberon for one of Victorias best panoramas, and to see how vegetation changes with aspect and altitude. 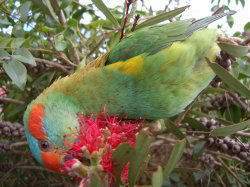 Walk the Lilly Pilly Gully Nature Walk to see heathland, eucalypt forest and rainforest. 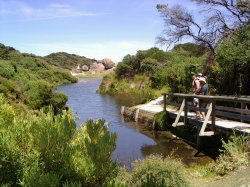 These walks are just some of those you can enjoy in half a day from Tidal River. There are also longer walks, such as to Tongue Point, Sealers Cove or Oberon Bay. A guidebook such as Discovering the Prom, available from the parks Information Centre at Tidal River, will help you to discover and enjoy these and many other walks, including overnight hikes (for which permits are required). Experience some of the parks secrets by taking an overnight hike to one of the 11 outstation campsites (accessible only on foot). Hikes range from beginner to intermediate standard, and one to five nights duration. Spend time in the Information Centre to find out about the many features and stories of the Prom. It has excellent audio-visual presentations as well as informative displays and maps. Explore the northern part of the Prom - an officially designated wilderness. Millers Landing and Vereker Lookout are easy family walks in this area. Get to know some of the Proms several hundred bird species, or go looking for koalas, wallabies or wombats. If you take snorkel or scuba gear, you can discover the underwater world surrounding the Prom - all of which is protected in a marine national park. If youre not able to go under water, explore intertidal life in the rockpools formed by granite boulders at many of the beaches. Take some time just to relax and enjoy the Proms fantastic atmosphere.